Ashley is a rural farm community on M-57, in Gratiot County. 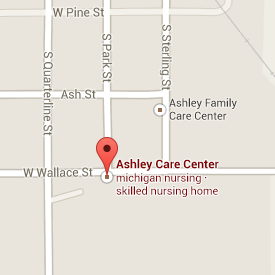 We are located approximately 20 miles north of St. Johns, south of Alma, east of Carson City and west of Chesaning. The Village of Ashley is friendly place to live, full of warm and very welcoming citizens. Our home is host to Ashley Trading Days, the third weekend of June and also the Ashley Country Christmas, held throughout the Thanksgiving to Christmas holiday season. School and recreational activities occur weekly such as football, basketball and baseball/softball. Other community events are the Ashley Lions Club Chicken Barbeque and local church dinners and bazaars. We welcome you to visit our small, but joyous town and take a tour of our facility!